The minutes from your board meetings are an important record of the decisions your directors make. Meeting minutes are also a great resource for a future board member or other senior staff leader who wants to understand the history of the organization he or she just joined. Unfortunately, meeting minutes are also important legal documents that might be used in the event of future litigation. Minutes strategy? Weird, right? Yes, but there is some strategy that informs the type of minutes your board takes. Many minute-takers record details of discussions that occurred during the meeting. However, some organizations record only the basics, like who attended, and the outcome of votes taken during the meeting. Even though it may seem strange, there is a sound reason for a minimalist approach to minute-taking. If your organization becomes involved in some sort of litigation, minutes may be included in the information used by the party suing you, and information that isn’t recorded can’t be used against you. There is no right or wrong answer to the type of minutes you should record for your board meetings. It depends in part on the type of organization you lead. Certain organizations like banks, credit unions, and trade associations are far more likely to end up in litigation than the local chapter of a social services organization or nonprofit. If you have any question about how much information you should record in your minutes, consult your legal counsel. 2. Record your minutes at the meeting, not later. Trying to construct minutes by memory is difficult and risky. Make sure someone is recording minutes during the meeting. Additionally, make sure that person feels comfortable asking questions if he or she doesn’t understand what action was just taken, or didn’t capture who made or seconded a motion. A meeting of an engaged board of directors can become lively or even heated, and it’s easy for a minute-taker to miss information. If that’s the case, make sure that individual (even if it’s you) asks for clarification. Inaccurate minutes negate the whole point of taking minutes—and can come back to haunt your organization in the event of future litigation. Yes, we know we keep talking about getting sued, but it can and does happen—and if you find yourself on the wrong end of a lawsuit, having accurate meeting minutes will be important. Especially if a decision by your board of directors is part of that lawsuit. 3. Distribute a draft of minutes soon after a meeting. It’s a best practice to distribute a draft of meeting minutes to your board of directors soon after a meeting. This allows directors to correct any mistakes or ask for clarification while the meeting is still fresh in their mind. Waiting to distribute a draft increases the risk that your directors will either fail to review the draft minutes, or remember the board meeting inaccurately. A relatively minor administrative task like drafting meeting minutes can go overlooked—until it’s too late, and you find yourself needing an accurate record of a decision your board of directors made that occurred months or even years in the past. The truth is that like agendas, meeting minutes are an important but often overlooked aspect of board governance. • Minutes Builder, a feature that allows you to keep track of attendance, minutes, resolutions, assignments, and votes during your meetings. • Total Content Control, which allows a board admin to manage when minutes and other information become available to users through multiple meeting stages. 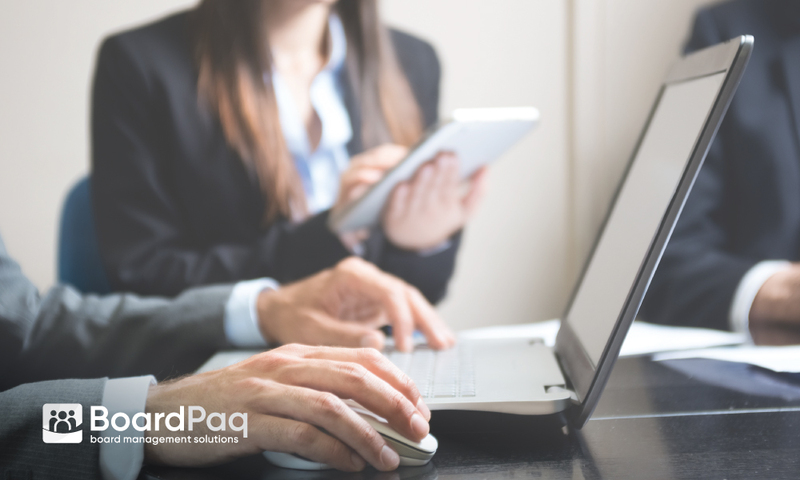 • Action Items, which allows users to quickly review a summary of board member tasks before and after meetings with BoardPaq&apos;s Agenda Follow-up Menu. You&apos;ll see everyone&apos;s feedback, including reviews of minutes and updates on assigned tasks. These features and more are available in BoardPaq’s Admin Center. Interested in learning more about the board portal of choice for more than 1,000 community banks, credit unions, school districts, trade associations, cooperatives, nonprofits, and other cost-conscious organizations? Dustin McKissen is the founder of McKissen + Company, an association management and marketing firm. He is a Certified Association Executive and has served as an executive or consultant to a wide variety trade associations, professional societies, and nonprofits. Learn how BoardPaq can work for you!